Nina Avramidou, President of the “International Centre for the Conservation of Architectural Heritage – Italy” (CICOP Italia) and of the International Confederation CICOP Net. Inserted in the Register of Honor of the Order of Architects and Landscape Architects of Tuscany (Italy, Member of the Order of Architects and Engineers of Athens, TEE, Greece, Medal for the University career received February 6, 2013 at the rectorate of the University of Florence, Founder of the Biennale of Urban and Architectural Restoration, Recognition of the professional career (Boton of ciudad) in Valencia, Venezuela, 1997, she has taught at the Faculty of Architecture in Florence for 42 years (Static of structures, Structural Typologies, Contruction Techniques, Technology of building Restoration, Architectural technology). Member at various times of different national and international scientific organizations, including: E.E.R.I. (Earthquake Engineering Reasearch Institute), Do.Co.Mo.Mo. (Documentation and Conservation of buildings sitesband Neighbourhoods of the Modern Movoument), E.P.E.S. (Hellenic Scientific Association for Research on Concrete Structures), member of task group n. 12 of C.E.B. (Comité Européen du Béton), 1983. She has directed numerous experimental studies – financed by the CNR (National Research Council) and MPI (Ministry of Education) and private entities – with regard to the restoration and structural reinforcement of masonry and R.C. structures, in various Italian university laboratories and abroad, including the laboratory for seismic tests of IASI in Romania, the test laboratory of the Academy of Sciences in Prague (Czech Republic). She has promoted and directed numerous postgraduate courses at the Faculty of Architecture of Florence, on the topics of Quality and Safety Insurance Systems, the Diagnostic of structural damages/degradations and the Structural Rehabilitation. 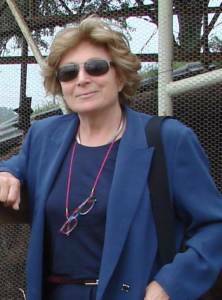 She has conducted post seismic stability assessments of more than one hundred public and private buildings in Italy and Greece, and has designed and directed numerous seismic reinforcement of historic public buildings in Basilicata (IT), Irpinia (IT), Campania (IT), Emilia Romagna (IT), Tuscany (IT), and Dodecanese (GR).